During my first days as a commander in the Los Angeles County Sheriff’s Department, Assistant Chief Mike Graham gave me a special assignment. He asked me to organize and head a committee, assess our gang enforcement efforts and make recommendations. That’s when I began to take a close look at a youth program called VIDA. Kids between the ages of 11 and 17 entered VIDA engaged in the kind of behavior and thinking that would one day land them in prison. But after 16-weeks of intense intervention, they were different kids: better attitudes, better outlook, equipped to make better choices. VIDA was created by patrolmen Drew Britness and Vince Romero, who’d relied on their experiences in the streets to design a winning program. After witnessing the success of VIDA, I recommended we expand it from East L.A., where it first operated, to other areas of Los Angeles County. The expansion would mean more kids would have an opportunity to change and become better. The expansion suggestion was well received and VIDA now operates in eight locations—and helps a lot more kids. It’s staggering to think of what the county would look like without VIDA. 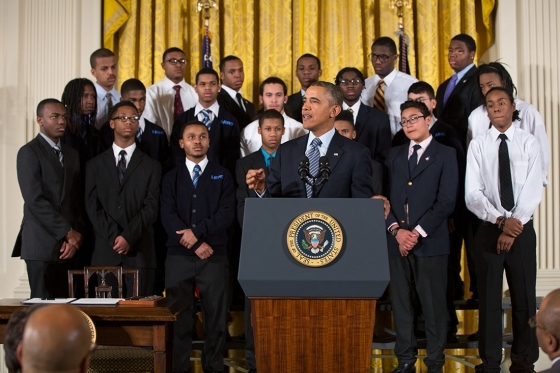 This is why I applaud President Obama’s “My Brother’s Keeper” initiative, which is designed to create opportunities for boys and young men of color. Too often we hear people talk of our youth as if they are aliens, here from another planet. They are different, hard to understand, beyond our ability to help. The truth is that you can visit any city in the nation and find youth programs that work. These programs are saving youth from dropping out of school, joining a gang, using and selling drugs, and engaging in violence and other criminal activities. The programs are setting kids on a right path. What you might find missing in Any City, U.S.A., is the political will, interest, and resources needed to expand the most effective programs. Faced with this lack, youth statistics worsen. And we hear more about the aliens: The real problem is those kids are just so different. But these are our children. Like every other generation they deserve the opportunity to have the tools they need to reach their fullest potential. They deserve a healthy environment in which to learn and grow. They deserve our best. We must approach our youth, not with a sense of futility, but with a dogged determination to find solutions. “My Brother’s Keeper” includes a task force that will determine which public and private efforts are working and how the government can encourage those efforts. This initiative is a real opportunity to save our brothers, sons, nephews, uncles, the neighbors’ boy. I look forward to seeing the outcome. And while we’re at it, please let’s not forget our girls. Ask any elementary, middle school, high school teacher and he or she will tell you about the trouble with girls…But that’s a topic for another blog post. This entry was posted in Uncategorized and tagged Assistant Chief Mike Graham, Los Angeles County, Los Angeles County Sheriff’s Department. Bookmark the permalink.